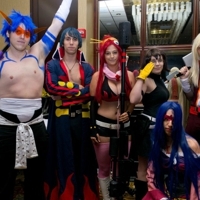 We proudly organize Anime Midwest, the second anime convention to come to Chicago. Anime Midwest brings together several thousand fans each year for a celebration of Japanese arts, culture, and entertainment. Fans dress up in costumes, participate in tons of events, and have fun. The convention features almost a dozen guests and 100+ events every year, ranging from our formal ball to our masquerade. We work hard to make our Chicago anime convention one of the most fun events in the entire midwest, by combining awesome special guests with some spectacular events. You can also join us for our annual Chicago convention called Con Alt Delete, which is usually held in December. C+A+D is a general cosplay, video games, and anime convention meant to bring congoers a fun weekend in a cold month.